All of my farm animals are special to me but I have to admit.. my mini horses are my favorite! I recently acquired a used pony carousel & had it “cut to size” – it was built for larger horses. Every day (that it’s not too hot out), I work the minis on it along with Madigan, the miniature donkey. She loves to be ridden and most kids are excited about riding a donkey! The important thing I learned is to train a “lead” pony – one that will take control and will drive the wheel for the others to just follow. I think Buddy will make a great lead pony and I’m working with him every day. I might be set up at the Rhea County Fair on September 7th & 11. If I do set up, I’ll have a special treat for the kids. This morning I bathed Coquette – who probably had never been washed in her life! She did very well and I managed to keep her under control providing I had treats to occupy her mind. It’s amazing how white & soft she turned out to be! 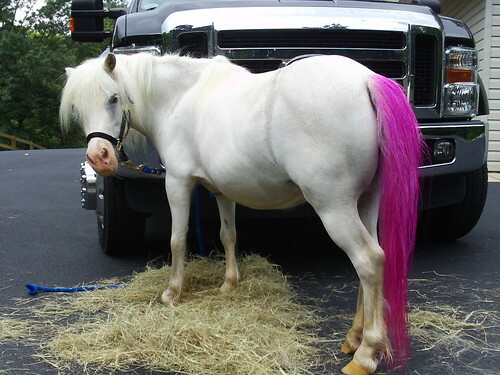 As a special effect, I dyed her tail pink! I planned on doing her mane also but the weather didn’t cooperate. Later on I bathed Buddy – he gave me a little bit of a harder time but we managed to get him nice and shiny. Just as I was getting finished, we got hit by a huge storm! In seconds I was wetter than Buddy! We ran to the tool shed and stayed under cover for a bit – the rain didn’t bother Buddy at all… it was bothering me! I managed to get his mane & tail untangled and nicely combed – he looks like a different horse! All this time Old Blue was hanging around looking at me as if asking, “Am I next?” I get around to her tomorrow! Once I have every one shiny clean (it doesn’t last… Coquette rolled in the dirt before I had the gate locked behind her), we’ll work on the carousel! I think bathing horses is a weekly chore if you want to show clean animals! 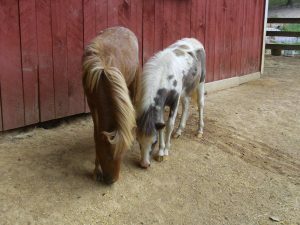 While on the subject of my mini horses, I’ve decided to try and sell Toffee & Buttons. If Buttons sells first, I may end up keeping Toffee – she still has a good 18 months before I can use her as a carousel pony but I think she may turn out to be a good driving pony. We’ll see what happens! Glad you enjoy my posts! Subscribe to my site & receive updates when I post! They really are very beautiful. I am charmed. I’ve spent the last week reading all I can about horses (not much out there specifically for mini horses), I’m amazed at how perfect all of my minis are. Even Glory that just got here a week ago – I was told she was a problem if let loose in a pasture as she would not let herself get caught. Not the case here, she comes to me like all the others. I could talk about my minis for hours! Thanks for posting!